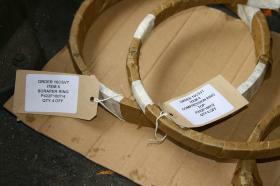 Big end bearing shell stretch bolt and liner seal rings May 2008 saw the arrival of the first batch of new engine parts that had been ordered from European Diesels. A sample of which are seen on the 4th May 2008. 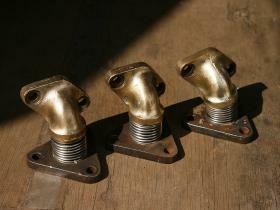 May 2008 saw the arrival of the first batch of new engine parts that had been ordered from European Diesels. A sample of which are seen on the 4th May 2008. New little end bush in con rod As part of the first order of engine parts all 16 connecting rods from the ex-50008 power unit were sent to European Diesels to have their little end bushes renewed. 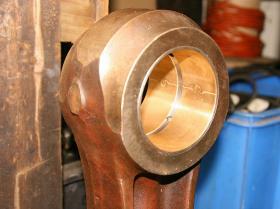 Here one of the connecting rods is seen with its new little end bush. 4th May 2008. As part of the first order of engine parts all 16 connecting rods from the ex-50008 power unit were sent to European Diesels to have their little end bushes renewed. 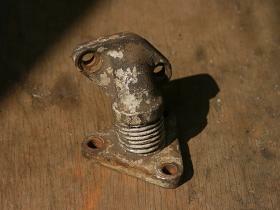 Here one of the connecting rods is seen with its new little end bush. 4th May 2008. Scraper and compression ring bearing and bolt The scraper rings, Top compression rings, and standard compression rings are seen wrapped in the greased paper that they arrived in. A big end bearing and a big end stretch bolt are seen in the background. 4th May 2008. 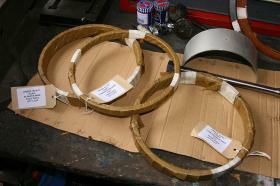 The scraper rings, Top compression rings, and standard compression rings are seen wrapped in the greased paper that they arrived in. A big end bearing and a big end stretch bolt are seen in the background. 4th May 2008. New compression and scraper rings This picture shows a closer view of the scraper rings and top compression rings. At this time four sets of everything had been ordered, a subsequent order was placed later in the summer for sufficient rings and seals to refit all 16 liners into the engine block ex-50008. 4th May 2008. 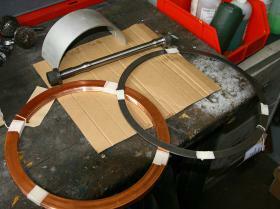 This picture shows a closer view of the scraper rings and top compression rings. At this time four sets of everything had been ordered, a subsequent order was placed later in the summer for sufficient rings and seals to refit all 16 liners into the engine block ex-50008. 4th May 2008. Clean engine water pipes Brass work is not limited to Great Western Steam engines, RRRG Volunteer Dave Rolfe ably demonstrates that even dirty old engine water jacket pipes can look impressive. 15th May 2008. Brass work is not limited to Great Western Steam engines, RRRG Volunteer Dave Rolfe ably demonstrates that even dirty old engine water jacket pipes can look impressive. 15th May 2008. Dirty engine water pipes By way of comparison, a water pipe seen prior to cleaning. By way of comparison, a water pipe seen prior to cleaning.